Who invented the X-Ray? The name of the person credited with inventing the X-Ray is Wilhelm Rontgen (1845 - 1923). Wilhelm Rontgen is not only famous as the German inventor of the X-Ray but also as a physicist and mechanical engineer. When was the X-Ray invented? Wilhelm Rontgen invented the X-Ray in 1885, during the Second US Industrial Revolution / Victorian period of invention (1850 - 1914). The invention of the X-Ray originated in Germany and is considered a highly important achievement to the field of Medicine. Definition of the X-Ray: The X-Ray is defined as a type of electromagnetic radiation of short wavelength produced when high-speed electrons strike a solid target. An x-ray machine sends individual particles through the body and records images of the inside of the body on a computer or film. Structures that are dense, such as bone, block most of the x-ray particles and appear white. X-Rays are used to detect abnormalities, such as broken bones, within the body for medical purposes and diagnosis. Fact 1: Who invented the X-Ray? The X-Ray was invented by Wilhelm Rontgen in 1885 during the Second US Industrial Revolution era of inventions (1850 - 1914). Fact 2: Who invented the X-Ray? Prior to the invention of the X-Ray in 1885, there was no alternative but to perform exploratory surgeries to identify injuries such as broken bones or tumors and the location of bullets. Fact 3: Who invented the X-Ray? The inventor of the X-Ray, Wilhelm Rontgen, was born on March 27, 1845 in Remscheid, Germany and died on February 10, 1923. He was married to Anna Bertha Ludwig and the couple had one, adopted child called Josephine Bertha Ludwig who was Anna's niece. Fact 4: Who invented the X-Ray? The early years of Wilhelm Rontgen were spent in Apeldoorn in Holland where he was raised by his wealthy German father and his Dutch mother. Fact 5: Who invented the X-Ray? Wilhelm Rontgen was educated the Utrecht Technical School. He was a terrible student, more interested in having fun than working on his studies. He ended up being expelled from school when he refused to 'snitch' on the name of a boy who had insulted a teacher. His father was furious as he wanted his wayward son to receive a good college education. Fact 6: Who invented the X-Ray? Wilhelm Rontgen eventually entered the Polytechnic School in Zurich, Swizerland taking courses in applied mathematics and mechanical engineering. Despite his early problems Wilhelm Rontgen began to excel in physics and thoroughly enjoyed working on experiments in the lab. Fact 7: Who invented the X-Ray? Wilhelm Rontgen completed his doctorate and following his education he took a job as a teacher at the Academy of Agriculture at Hohenheim, Württemberg. He enjoyed teaching and continued to conduct research in the subjects that particularly interested him. Fact 8: Who invented the X-Ray? Wilhelm Rontgen was fascinated by Electricity and began to experiment in discharges of electricity through conductors and insulators. He admired the work of the English scientist Michael Farady who had discovered the electromagnetic rotation in gases and the effects of the conduction of heat in crystals. He also began studying cathode ray tubes. Fact 9: Who invented the X-Ray? His interested in physics and his experiments in the lab resulted in Wilhelm Rontgen's accidental invention of the X-Ray. He began to focus on cathode ray tubes, and the work of Sir William Crookes (1832-1919) and Johann Willhelm Hittorf (1824-1914), and began replicating many of the classic experiments involving cathode ray tubes. Fact 10: Who invented the X-Ray? In one of his experiments he covered a cathode ray tube in foil and placed it in an cardboard covering to prevent light from entering. He then went on to investigate the weird glow that came from the electron beam that was omitted from the cathode ray tube on different types of surfaces. He then started to paint various colour producing chemicals and compounds on screens to assess the effect. Fact 11: Who invented the X-Ray? Wilhelm Rontgen prepared a paper screen that he painted with barium platinocyanide. Wilhelm Rontgen was particularly interested in Barium platinocyanide because it had the properties of Phosphorescence, Cathodoluminescence and Fluorescence. Fact 12: Who invented the X-Ray? Phosphorescence is something that glows with light without becoming hot, Cathodoluminescence is luminescence excited by the impact of an electron beam and Fluorescence is the light produced when electricity flows through a tube that is filled with a type of gas. Fact 13: Who invented the X-Ray? Wilhelm Rontgen held up objects in front of the beam and and every time, the barium platinocyanide screen would light up. He experimented with many different types of materials such as paper, cardboard, wood, rubber and tinfoil and found that the beam was still visible. Fact 14: Who invented the X-Ray? Wilhelm Rontgen discovered that although the cathode tube, that was covered in foil and the room was completely dark, that the screen covered in fluorescent material (barium platinocyanide) was illuminated by the rays. Fact 15: Who invented the X-Ray? Wilhelm Rontgen had discovered that, under certain conditions, cathode rays generated new and different rays as they impacted on an object. Fact 16: Who invented the X-Ray? Whilst conducting his experiments Wilhelm Rontgen also discovered that there was one exception - a sheet of lead completely blocked the rays - they could not penetrate lead. Fact 17: Who invented the X-Ray? Wilhelm Rontgen called these new rays "X-rays". As he continued to look at the effect of an "X-Ray" on lead Wilhelm Rontgen received the shock of his life. Whilst holding a disc of lead between his fingers he was startled, indeed horrified, to recognize the outline of his own bones. Fact 18: Who invented the X-Ray? Wilhelm Rontgen quote: He detailed the phenomenon in his note book saying "If one holds a hand between the discharge apparatus and the screen, one sees the darker shadow of the bones within the slightly fainter shadow image of the hand itself". Fact 19: Who invented the X-Ray? The projected image of his own hand showed a marked contrast between the solid bones and the translucent, semi-transparent flesh. Fact 20: Who invented the X-Ray? Wilhelm Rontgen realised that his extraordinary discovery of the X-Ray allowed the internal structures of the body to be made visible to a physician, without the necessity of surgery. Fact 21: Who invented the X-Ray? Wilhelm Rontgen then went on to complete another important experiment - he used a photographic plate to capture an image of his wife's hand, complete with her wedding ring. Fact 22: Who invented the X-Ray? The invention of the X-Ray in 1885 caused a sensation in the medical world and beyond and almost immediately X-Ray Departments were set up in various hospitals and infirmaries. Wilhelm Rontgen never patented his invention of the X-Ray, he just wanted mankind to benefit from his discovery. He received many honors and was awarded the very first Nobel Prize in Physics in 1901. Wilhelm Rontgen died from carcinoma of the intestine in Munich, Germany on February 10, 1923. Fact 23: Who invented the X-Ray? In 1896 the French physicist Henri Becquerel (1852 – 1908) was using naturally fluorescent minerals to study the properties of the newly discovered x-rays and became the first person to discover evidence of radioactivity by proving that the uranium emitted radiation without an external source of energy such as the sun. Henri Becquerel had discovered radioactivity. Fact 25: Who invented the X-Ray? At the time no one had any idea that an x-ray, radioactivity or radium could be dangerous and over exposure to radioactivity and radium. This exposure eventually resulted in the death of Marie Curie from leukemia on on July 4, 1934. Fact 26: Who invented the X-Ray? Scientists then began noticed that prolonged exposure to x-rays created inflammation and, occasionally, tissue damage on the skin and special measures were taken to protect both the patient and doctor. By the early 1920's research into the damaging qualities of the x-ray led to another important discovery, they were shown to be very powerful in fighting cancers and skin diseases. Fact 26: Who invented the X-Ray? 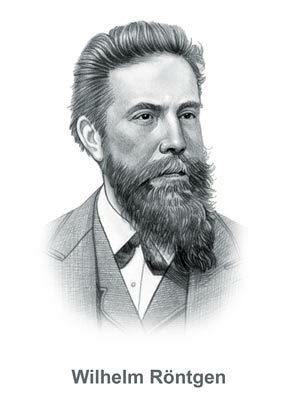 The ideas that stemmed from the discovery of the X-Ray continue to the modern day as scientists continue research the power that might be held in rays of light which led to the invention of the Laser in 1960.
Who Invented the X-Ray - Wilhelm Rontgen - Inventor - Invention - Definition - Meaning - Famous - Important - X-Ray History - X-Ray Timeline - Innovation - Significant - Development - Medical - First - X-Ray Definition - Kids - Facts - Information - Info - Who invented the X-Ray - Dates - When - Why - Impact - X-Ray Purpose - Use - New - Old - Amazing - Best - Definition - Meaning - Awesome - Cool - German - X-Ray History - Timeline - Who Invented the X-Ray?